Despite considerable efforts by biopharmaceutical companies, late-stage trial failures have plagued the drug development process for targeting Alzheimer’s disease. So what’s the problem? Typically, patients with a definitive Alzheimer’s disease diagnosis have been recruited into clinical studies of new potential therapies. However, this tasks the treatment with the considerable challenge of both halting and/or reversing the existing pathology. Consequently, treatment trials are now moving earlier in the disease process towards preventative rather than reactive administration. New approaches to target selection and treatment strategy are needed to focus on earlier stages of disease prior to the extensive neurodegeneration resulting in dementia. A 2018 Guidance from the US FDA outlines current diagnostic criteria and definitions for the stages of early Alzheimer’s disease, and suggests possible primary endpoints that may be appropriate to serve as the basis for drug approval. The approaches to trial design suggested in the guidance provide exciting new opportunities for drug development but also raise unique challenges to the execution of such trials. One major challenge is finding the right patients for early stage Alzheimer’s disease clinical trials. In this webinar, Dr. Kenton Zavitz, Director of Clinical Affairs at Cambridge Cognition, and Dr. Robert Smith, Consultant Neuropsychologist, will discuss the issues surrounding the identification of patients for these early Alzheimer’s disease trials, and will suggest potential solutions and strategies to facilitate both clinical development as well as drug commercialization. Dr. Zavitz has over 18 years of biotechnology and pharmaceutical experience with involvement in all aspects of the industry from drug discovery and clinical development through to pre-commercialization. Prior to joining Cambridge Cognition, Kenton served as Chief Scientific Officer for New Mexico-based biotech Zocere Inc. where he worked on developing a neuroprotectant drug designed to combat brain injury resulting from stroke. From 1998 to 2012, Kenton worked at Myriad Pharmaceuticals, Inc. where he served as Chief Scientist of the tarenflurbil clinical development program (an investigational drug for the treatment of Alzheimer’s disease, developed through Phase 3). Kenton received his PhD in Biochemistry and Molecular Biology from The Sloan-Kettering Division of the Weill Cornell Graduate School of Medical Sciences in New York City. He was a Postdoctoral Fellow at the UCLA School of Medicine and was awarded fellowships from the Leukemia Society of America and the Jane Coffin Childs Memorial Fund for Medical Research. Dr. Smith is a clinically trained neuropsychologist with more than thirty years’ experience in clinical trials involving cognition. Dr. Smith has been an investigator on over 100 clinical trials in Alzheimer’s disease, vascular dementia, Parkinson’s disease, and mild cognitive impairment. He also has experience in other indications such as depression, epilepsy, migraine, and chronic pain. Dr. Smith has published extensively in the cognitive field, and has been an advisor to a number of pharmaceutical companies regarding development of research protocols and post marketing issues. In that capacity he carried out six lecture tours in Japan between 1993 and 1995 and visited 15 Japanese cities, typically lecturing to about 200 doctors, including local opinion leaders. Dr. Smith has carried out training at numerous investigator meetings, and has extensively trained hospital dementia teams in the development of treatment protocols for the prescription of acetyl-cholinesterase inhibitors. He is particularly interested in Prodromal AD, and has recently worked on a number of clinical trials in this indication. 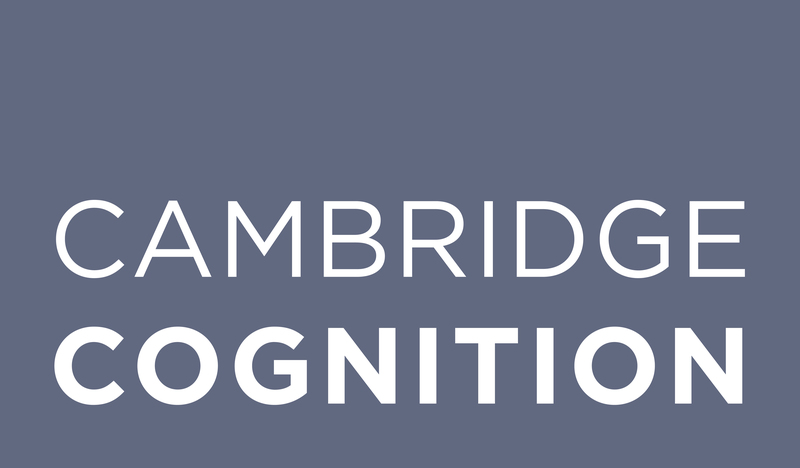 Cambridge Cognition is a neuroscience digital health company which develops & markets gold standard medical software products and expert scientific services to accelerate the development of safe and effective treatments and quantify cognitive health in patients worldwide. The company provides products and services to the world’s leading pharmaceutical and biotech companies as well as globally renowned academic institutions.